The Government, Military and Veterans Affairs Committee heard testimony March 17 on three proposals for nonpartisan election of county officials. LB183, introduced by Venango Sen. Dan Hughes, would allow counties with a population of fewer than 15,000 residents to adopt a nonpartisan primary ballot for election of county officers. If a county adopted the change, the general election ballot would list the top two vote-getters from the primary – regardless of party affiliation – on a partisan ballot. The change to a nonpartisan primary would require voter approval and could be initiated by the county board or by petition. The question of moving to nonpartisan ballots could not be put to voters more than once every three years. 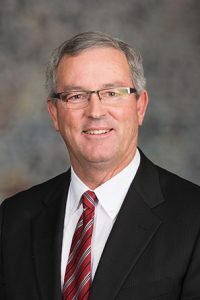 Hughes said changing to a nonpartisan ballot could increase voter participation in rural counties by allowing all registered voters to participate in the primary election. He offered an example from a county in his legislative district in which all four candidates for sheriff belonged to the same party. J.D. Schluntz, a Harlan County supervisor, testified in support of the bill, saying many nonpartisan voters feel left out of the current primary system. LB183 would enable county residents to decide whether to switch to a nonpartisan system in order to increase voter participation, he said. LB139, introduced by Bellevue Sen. Sue Crawford, would allow for nonpartisan election of county officers in both the primary and general election in any Nebraska county. The bill would allow the change to be initiated by a county board or by voters and the question could not be put to voters more than once every three years. Crawford said that one-third of Nebraska voters do not have a party affiliation but are interested in politics and eager to participate. Nonpartisan elections work well for the Legislature, she said, and opening up county elections to the same process would benefit the state. “This bill is about two fundamental Nebraska principles: local control and the value of nonpartisan governance,” she said, noting that not all counties may wish to participate, but those that do could learn from the experience of early adopters of the new system. In contrast, LB111, introduced by Lincoln Sen. Matt Hansen, would require all 93 counties in Nebraska to move to nonpartisan election of county officials. Bri McLarty Huppert, representing Nebraskans for Civic Reform, testified in support of both LB139 and LB111, saying either proposal could encourage greater nonpartisan voter participation across the state. Nebraska’s partially closed primary system can be confusing for nonpartisan voters and election workers, she said. “Expanding nonpartisan elections to the county level would, we believe, be one of the ways that we could provide greater visibility that nonpartisans can participate in the primary elections,” McLarty Huppert said. Nathan Leach of Nonpartisan Nebraska also supported LB111, saying that candidates should run on issues and not party affiliation. In addition, he said, partisan ballots essentially are publicly-funded advertisements for political parties, which are private organizations. Beth Bazyn Ferrell of the Nebraska Association of County Officials testified in opposition to all three bills. Among the organization’s concerns is the singling out of county officials for nonpartisan election when many other offices in Nebraska are elected on partisan ballots, she said. The committee took no immediate action on any of the bills.